For my last meal on this earth, I would most certainly request the following menu: A small plate of French fries to start, followed by a main course of French fries, with a quick palate cleanser of French fries, all finished with a surprise treat of, YES, more French fries. By now, it should be clear that I’ve never met a fried spud I didn’t like. But as someone living with kidney failure and needing to say goodbye to over-salted prepared foods (as well as potatoes – thanks, potassium! ), I did what I always do when it comes to foods I love: get creative, think outside the packaged box, and find another way to please my palate! Whether that’s a Bloody Mary, a pizza party, or, French fries. Luckily for us all, it turns out making fries from scratch, without packaged ingredients is quite easy. And better than that, potatoes are not the only ingredient that can be cut and baked into fry-like shapes (or dipped into delicious sauce). 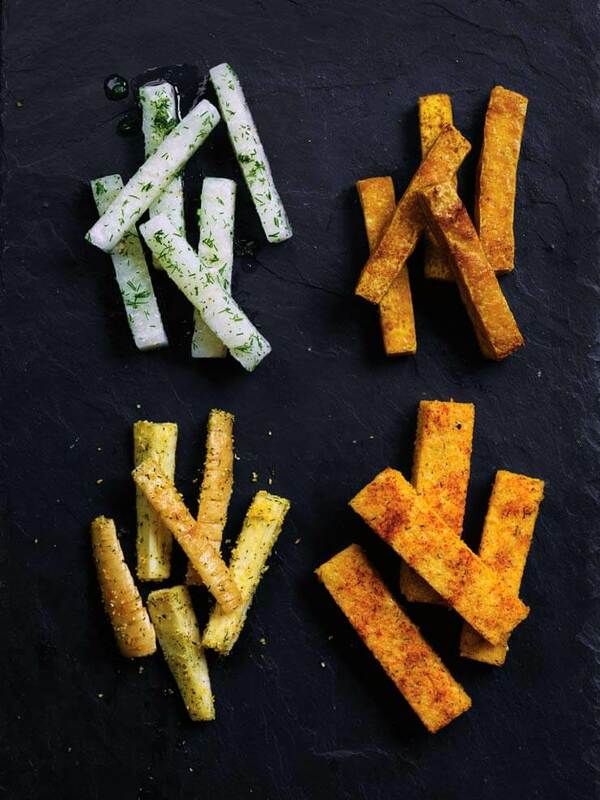 Which brings me to my four, unprocessed and spud-free fry alternatives, for every taste and occasion: Crunchy Parsnip Fries; Chili Polenta Fries; Curry Tofu Fries; and Raw Jicama Fries. Even if you can eat potatoes, I encourage you to give these fries a try. Because twisting traditional recipes is a great way to wake up the taste-buds as well as your creativity in the kitchen. So suspend fry-reality for a bit, and dig into these healthy snacks. And for your dipping pleasure, pair your fries (any of them!) with these two homemade hot sauces. 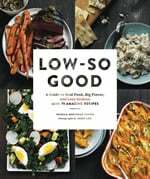 Recipes from Jessica’s book Low-So Good: A Guide to Real Food, Big Flavor, and Less Sodium. Photo by John Lee. Parsnips are very similar in appearance to carrots - though they're not in the same family of vegetables. They have a slightly sweet flavor, but they're actually a bit savory and work great in this recipe. Preheat the oven to 400°F [200°C]. Coat a large baking pan with vegetable oil or cover with aluminum foil. In a large resealable plastic bag or a big bowl, mix the cornmeal, vegetable oil, garlic powder, dill, black pepper, and cayenne. Add the parsnips. If using a bag, close and shake; if using a bowl, mix with your hands until the parsnip fries are coated with the cornmeal mixture. Transfer the coated parsnips to the prepared baking pan, laying them out in a single layer. Bake until crispy, 20 to 22 minutes, flipping halfway through. Variation: Want a healthful topper for your next barbecue? Use a peeler to make long ribbons from the parsnips instead of fries, yielding about 2 cups [240 g]. Bake as directed until crispy, 8 to 10 minutes. Enjoy them like onion rings. Put a new spin on polenta with this inventive - and incredibly tasty - dish! Lightly coat an 8-by-8-in [20-by-20-cm] baking pan with olive oil. Add 1 teaspoon of the chili powder, the dill, and garlic powder; turn the heat to low; and continue stirring until the polenta is thick and the liquid is absorbed, 10 to 12 minutes. Remove from the heat and transfer to the prepared baking pan, using a spatula to evenly spread the polenta to the edges of the pan; the polenta should be about 1/2 in [12 mm] thick. Put in the refrigerator to cool, uncovered, for 30 minutes or up to overnight. Run a knife around the edge of the polenta to loosen it from the sides of the pan. Hold a cutting board on top of the pan and flip, letting the polenta fall out of the pan and onto the cutting board. Brush the top of the polenta with a little olive oil and sprinkle with the remaining 1/4 teaspoon chili powder. Cut the polenta into fry shapes—skinny fries or thick steak fries, whatever you’re craving. Place them in a single layer in the prepared baking pan and bake for 10 minutes. Flip and bake for another 10 minutes, until golden brown. Turn on the broiler for the final 2 minutes if you want them extra crispy. Tofu is a surprisingly flexible food - it has so many different applications. Try this spicy, savory version and see for yourself! Coat a baking pan with vegetable oil or line with aluminum foil. 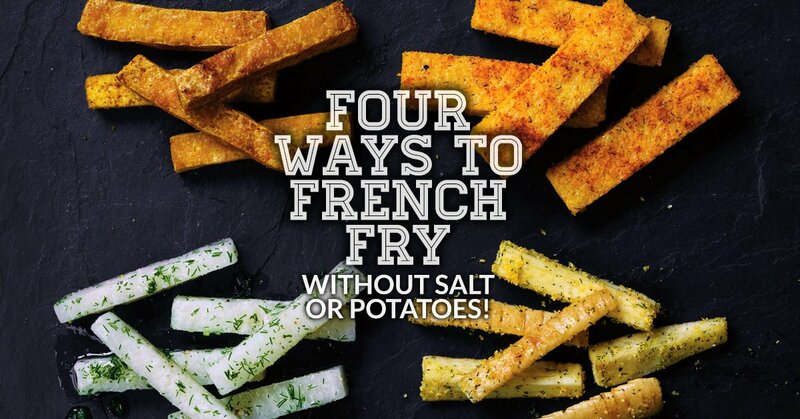 Cut the tofu into french-fry shapes. Spread the tofu fries on the prepared baking pan in a single layer. In a small mixing bowl, combine the sesame oil, garlic powder, curry powder, and cayenne. Using a pastry brush, paint the tops of the tofu fries with one-half of the seasoned sesame oil. Bake for 20 minutes. Carefully turn the fries, and paint with the remaining half of the seasoned sesame oil. Return to the oven and cook until the tofu fries become slightly puffy and crispy, about 15 minutes longer. Here is a fun, savory-sweet snack or side dish - with no cooking involved! In a small food processor (or blender), combine the dill, garlic powder, pepper, olive oil, and orange juice and pulse until smooth. Peel and cut the jicama into french-fry shapes, about 1/2 in [12 mm] thick and 3 in [7.5 cm] long. In a medium bowl or a shallow container, mix the jicama with the dill oil. Cover and refrigerate for 30 minutes, or up to overnight, before serving.